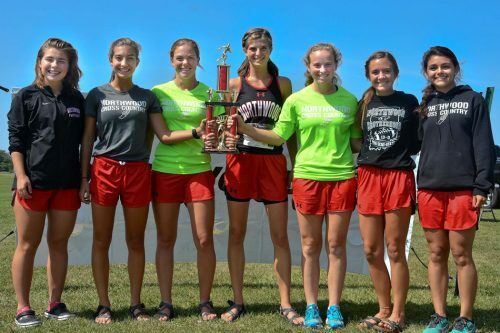 NAPPANEE – It’s still August, but the cross country programs at NorthWood and Wawasee had a chance to call themselves ‘champions’ on Saturday. 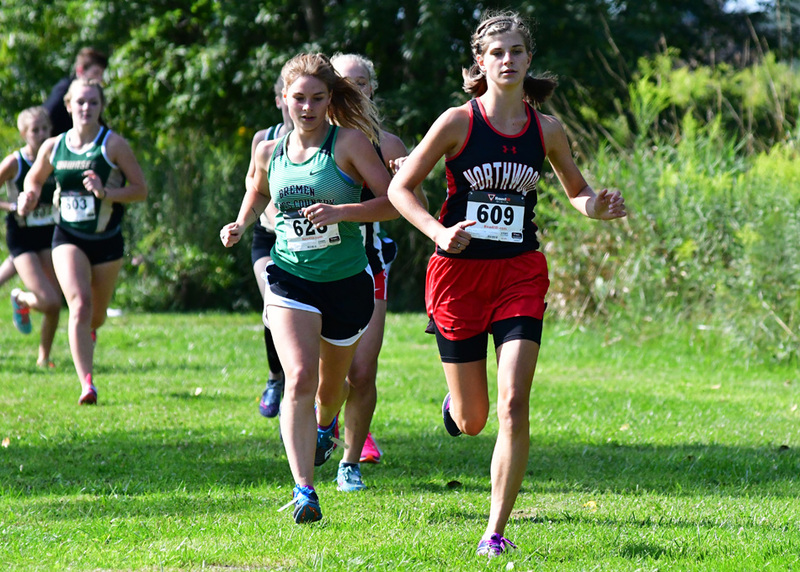 The Lady Panthers and Warriors each claimed team titles, and NorthWood’s Erica Stutsman added an individual title to her belt as action unfolded at the NorthWood Cross Country Invitational at Stauffer Park. Following the lead of South Bend St. Joe’s Skip Morrell’s blistering pace around the course, Wawasee stayed close behind and made sure it’s pack runners were within distance. With Spencer Hare keeping up with Morrell and Luke Griner just into dew flicked up from their spikes, the two Warriors were able to remain in the top five throughout the 5,000 meters. Morrell would kick in late and pull away for a title at 16:19.51, with Hare chasing him down the hill at 16:32.62 for second place and Griner outpacing Concord’s duo of Luke Owings and Luke Shoemaker for third place at 16:45.55. Wawasee then had Mike Hammer place seventh at 17:41 and Thomas Conley not far behind at 17:50 for tenth place. Wawasee head coach Chad Hoffert camped well away from the finish line, looking to find any edge to will his runners in. Finding that location at the 1,000-meter mark, Hoffert urged both Braxton Alexander and Bennett Hoffert to catch any Concord runner they could. Figuring Concord had a great chance to sneak enough points for the team title, coach Hoffert got Alexander and his son (Bennett) to catch Concord’s Bryce Cook. Alexander was 17th and Hoffert 18th to Cook at 19th. 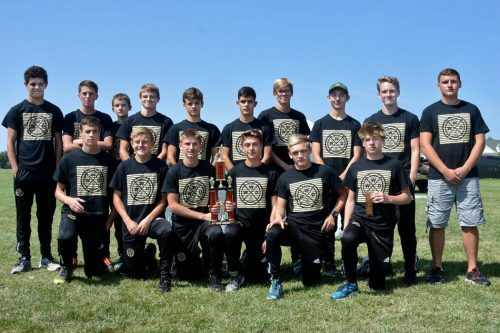 The placement was key not just in securing the team title – St. Joe wound up second at 53 points – but gave Wawasee the edge against one of the Northern Lakes Conference teams Hoffert feels could be in play in just over a month. 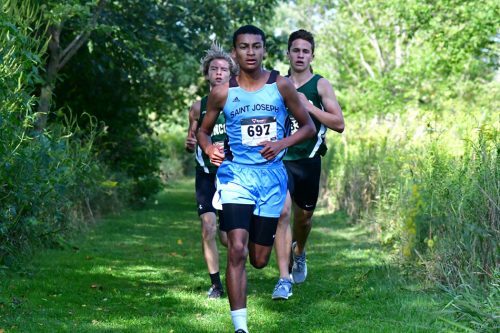 South Bend St. Joseph’s Skip Morrell paces the boys field en route to his individual championship. NorthWood’s boys finished fourth as a unit with 106 points. Tyler Evers made the top 10 but finishing ninth overall at 17:46. Making up the team scorers were Garrett Myers (16, 18:05), Stephen Schmidt (22, 18:37), Arron Smith (25, 18:47) and Sam Schlatter (34, 19:11). The Panther girls, on the other hand, peppered the front of the race and also held off Concord for the championship. 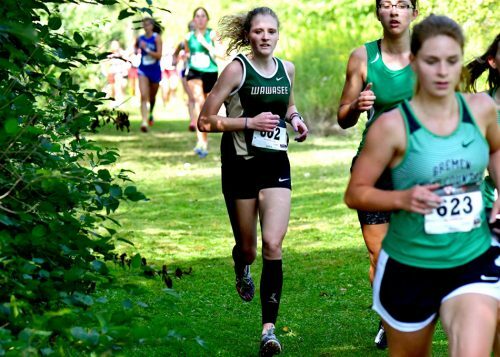 Led by individual champion Erica Stutsman, the Lady Panthers looked right at home on its course. Stutsman never trailed in the girls race, only challenged by the footsteps behind her changing depth. At about 4,900 meters, Stutsman looked like she would run away as champion, but Concord’s Alexa Porter made a late dash down the hill and raced Stutsman to the chute. 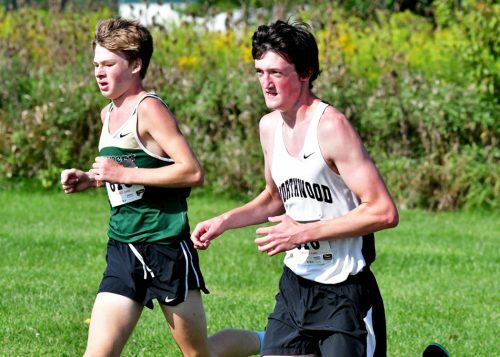 The NorthWood senior was able to hang on for a 20:06.47 winner, Porter a valiant 20:09.05 runner-up. Concord then had the next two come home in Jana Fisher and Summer Cooper, who paced each other past runner after runner on the second lap of the course only separated by John Glenn’s Makenzie Hudgen running as an individual. Hudgen was third at 20:21. From there, NorthWood had three of the next six runners cross the timer, with Whitney Wolfe fifth (21:08), Jenny Martinez sixth (21:13) and Kate Jarvis tenth (21:29). Concord’s fourth, Sydney Simon, placed 16th, the gap between her and Jarvis the difference in the team title. Wawasee would take fifth in the girls race, still running a bit shorthanded with a pair of its seniors still ineligible. Running Saturday were McKenzie Smith (12, 21:43), Caitlin Wortinger (15, 22:15), Valeria Pizana (20, 22:32), Autumn Turner (23, 22:53) and Evelin Romo (43, 25:54). 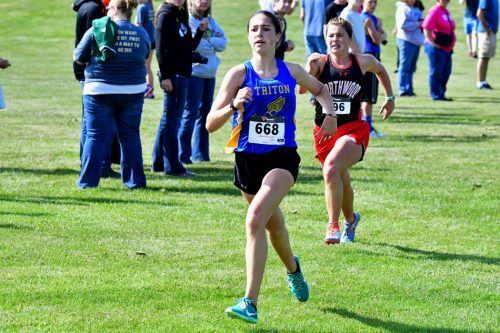 Triton had runners in both races, but did not factor in any frontline scoring. 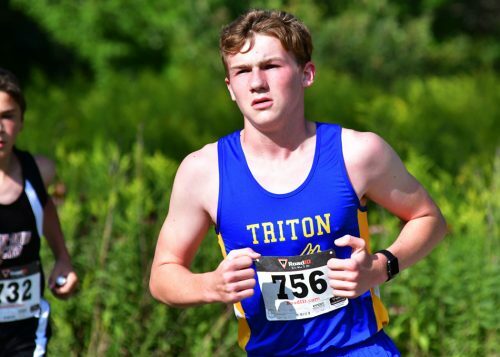 The boys team had Josiah Page placed 40th overall in its top showing, a time of 19:25. The girls did not have a team in the mix with just two runners on the course, but both were in the top 30 as Baylee McIntire was 16th at 21:57 and Briana Wilhite was 27th at 22:59.